Many family firms incorporate philanthropy into their business model in order to align the family’s core values and the business strategy. The family’s personal drive to “give something back” may be at the heart of family business giving — and the business giving may sit alongside a parallel family foundation that reflects family members’ personal giving priorities. Other families may be swayed by employees’ and customers’ deeper connection to a firm that is actively engaged in improving local conditions, supporting projects aligned with the core activities of the business, or simply “doing good.” And as businesses of all sizes and across sectors become increasingly aware of market perception and branding, being regarded as a “good corporate citizen” may have strategic value. Some family firms have been giving for generations, often in parallel with the family foundation. Others may start giving when the success of the business, or the profile of the family, grows so much that failing to give could be detrimental. 1. Assuming giving is easy. Those who have worked hard to build or sustain a family business may believe that giving money away is “just fun.” However, effective giving requires strong engagement and deep commitment, as well as careful planning and sound guidance when warranted. The family must pay as much attention to its philanthropic initiatives as it does to its business or investment activities. 2. Blurring the lines between the family philanthropy and the business. Most jurisdictions prohibit charities from subsidizing private business. The tax breaks and preferential status charities enjoy come at the cost of limitations on their activities. Particularly when a family name is featured in both the foundation and the business, it is important to approach this issue with care. For instance, if the business sponsors a museum exhibition and the family foundation additionally contributes to the museum, care must be taken to ensure the foundation’s gift is not providing the business with any benefits beyond those merited by its own level of sponsorship. 3. Failing to think strategically. It is said that many people go into philanthropy with “open hearts and closed eyes.” While it is important to harness the passion of those involved in the family foundation, families who don’t think strategically about impact are missing an opportunity. Just following the passions — or whims — of family members on the foundation board may do little to improve family cohesion, can alienate the next generation (if the board does not include them) and ignores the benefits of giving in synergy with the business activities. Setting aside a sub-fund for ad hoc giving may be a solution to this ­conundrum. 4. Ignoring succession planning. Like succession in the family business, succession in the family philanthropy is inevitable, even if it’s difficult to accept. The situation can be particularly difficult if the business succession is complex or fractious. It is tempting to put off succession decisions, but dealing with the issue proactively is by far the better option. 5. Relying too much on employee initiatives. Some families keep their family giving totally separate from the business. Others may seek to involve employees and contractors in corporate social responsibility activities that the family foundation also funds. This may be smart on a number of levels; for example, employees can feel like part of the family when this works well. However, if the balance is off, savvy employees (and the public or press) will notice. For instance, if employees raise funds for a local children’s hospice and the family foundation matches the funds 2 to 1, the effort will be well regarded. But if the amount given by the family personally is minimal, it may seem that those who can better afford to give are riding on the coattails of the less wealthy. 6. Overlooking conflicts of interest. Family foundations are likely to have conflicts of interest or duty on the foundation board that must be declared and managed. 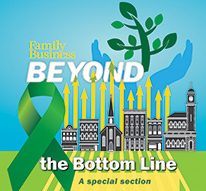 This issue is amplified for business families. Family members who serve on the foundation board and are also employees or officers of the business will have a conflict of interest any time the foundation makes a grant to a project the business supports or sponsors. Depending on the jurisdiction, foundation conflicts are often manageable, but some formality around board decision making may be required. 7. Assuming everyone will always get along. All family foundations, whether connected to a family business or not, are affected by family dynamics and changing relationships. A board may operate by smooth consensus for a period and then may find that external stressors — such as business succession or divorce — invade the foundation governance. Depending on the family, managing these issues can be hard work or seemingly impossible. 8. Keeping family governance and wealth structures too separate. Many families compartmentalize; they keep the family wealth/business on one side of an imaginary line and the foundation on the other. There is logic to this approach. After all, the foundation’s assets no longer belong to the family; they are subject to special regulation and oversight. However, holistic planning for the family enterprise must include consideration of the family’s philanthropy. It can be extremely inefficient to deal with estate planning separately from succession planning for the family foundation. 9. “Parking” family members in the foundation who are not up to the family business. Family members who are underperforming in the business should not be “demoted” to the family foundation. It is true that a family foundation may offer a great opportunity for educating the next generation in financial management, responsibility and family values. If there is a real desire to include an underqualified family member in the foundation, the board has a responsibility to ensure that person does not represent a risk to the foundation. The family member should not serve as a fiduciary (i.e., foundation director or trustee), and should be subject to sufficient oversight and control to ensure the foundation’s assets are not at risk. In the extreme (and depending on jurisdiction), the board members could be individually responsible for redressing any loss the foundation suffers if, for example, that family member embezzles charity funds. 10. Assuming that getting it wrong carries no real consequences. There can be a sense that the foundation is a safe environment and that there are no real consequences for philanthropic missteps. After all, the assets were to be given away in any event, so there is no detriment to the family if the money is given to one cause or another. But the “halo effect” that giving is said to have can easily become just the opposite if the family foundation is mismanaged. In most jurisdictions, misapplication of funds and other breaches of duty can lead to real consequences for the foundation, including in some circumstances individual board members. Where the association of the foundation with the business has been prominent, or where the family name is shared between the business and the foundation, the business can also suffer reputational damage. The board should be sure to have a good grounding in the operational compliance of the foundation and proper oversight of all projects and initiatives. Delegated authorities should be reviewed and risk properly assessed. If things go wrong, tackling the problem head-on, with reputation management advice if needed, is the only way forward. The benefits of family philanthropy, especially for families connected to a business, far outweigh the challenges. These pitfalls can be avoided with sufficient care and mindfulness. Alana Petraske is special counsel at Withers LLP.